Thanks to social media and eBay listings I quickly found out about the damage to 2015 Topps Tribute Baseball. The overwhelming majority of autographs were smudged, streaky or broken straight out of the packs. Rumblings about the entire release having issues flooded Twitter timelines and card forums. Speculations as to what happened and how Topps was going to handle it ran rampant. In public I remained silent. I had ideas of what had happened and how Topps might respond. But it was clear this was going to be a no win situation for Topps. EVERY card company has had issues in the past and the usual response is “any damaged cards will be replaced,” a fix it as we go approach. But today Topps did the most bold thing any company can do which is also the right thing. 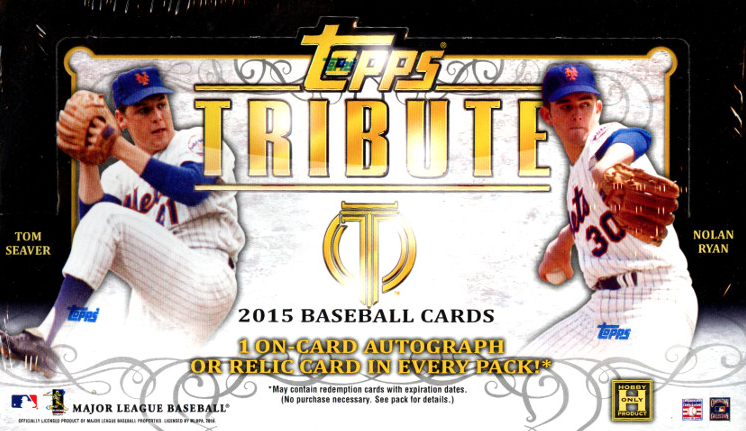 Topps has issued a complete recall of 2015 Topps Tribute Baseball. Any collector that still has a sealed box should return it to the point of purchase by March 27, 2015 and they will receive a full refund. If you bought your box from an online retailer I would contact them about methods to return boxes. For those of you that opened boxes or are being shipped cards from box breaks or bought early singles on the secondary, if you have a damaged autograph card that is not still sealed in a pack, you have the option to contact Topps Customer Service and arrange for an exchange of that card before June 30, 2015. Exchanges will be made for another card of equal or greater value, PLUS a bonus autograph or relic. Values for exchange will be determined by Topps at their discretion. Collectors are angry, and rightly so. No one wants to open a high end product and find any damage. Finding damage to almost every hit in a box probably wasn’t even a thought for any collector or even Topps. So clearly something went wrong. From Topps' statement the damage is due to UV contamination on the card. As a collector with a lot of experience autographs I can tell you this makes perfect sense. For example, if you want a player’s autograph on a baseball, if you get them to sign with a Sharpie chances are that auto will become a faded blur over time, if it’s cheap baseball, sometimes within months. Sign a vintage card with ball point pen and the ink will disappear over time leaving just the indentation of the signature. Hang a signed photo in a frame without UV protection in a well lit room and over time both the autograph and the photo will degrade. And even if you don’t like the explanation, this is about as good a response from a card company as I have seen in a long time. Topps is clearly backing up their product at a huge financial loss. Let’s not forget about Press Pass closing up shop early this year without warning, leaving redemption holders out in the cold. I still have one. The only criticism at this point that I can see leveled against Topps that could be justified is quality control after pack out. Without a full understanding of how their systems work, there appears to be a need for a bigger buffer between time of release date and the opportunity for Topps employees to open test cases that have been shipped to their offices so they can truly see what the end user experience will be. But that is me just speculating. But regardless of the reasons this happened, all in all I think we need to stand behind this response. We need competition in the hobby. Wishing ill will on this company is entirely misplaced. Collectors have the right to feel upset about the inconvenience of this and the absence of Tribute this year, but based on how Topps is handling this, that should be the extent of it. As collectors we have to hold card companies accountable for their mistakes. We have to voice our concerns, even with negativity, but do it with the intent to convey to companies what will bring products come closer to our needs. For me Topps is a vital part of the collecting world that NEEDS and DESERVES to be a part of the hobby and their plans to rectify this situation goes above and beyond. The hope is that their execution of that plan goes just as well. But I’m sure there are still some of you who are pessimistic about that and if you’ve made it all the way here to the end of this post, that probably means you are a reasoned person. A collector that wants to support this hobby and so I would like to extend an offer to a limited number of you who have out of the pack singles. If you are upset and don’t want to deal with Topps Customer Support, you can deal with me. I will extend the same offer Topps has extended to a small number of you but it will be on a pre agreed upon arrangement. Please keep in mind I don’t have the resources that Topps does, so I can’t do this for everyone. If you follow us on our blog or on Twitter, have a U.S. address (sorry International collectors, shipping just makes this too cost prohibitive to do) and we can agree upon a card exchange through email, I will give you what Topps is offering, but only if we can complete the transaction in a timely manner. Then I will deal with Topps Customer Service. And I’ll say upfront, if you are a scammer, you won't like the terms I’ll put on this so don’t bother. And I won’t be able to do this for some of the most expensive autographs in the release and large amounts of cards as I simply don’t have that much inventory. I’m doing this as a service to our loyal readers/followers and because I have full faith in Topps after this announcement. In no way is this associated with Topps. They are not sponsoring this exchange and they won't even know about this until someone from the company reads this post. I will be doing this for a month and a half, through to May 8, 2015. That way if you don’t like what I can offer you through email exchange, you will still have time to deal with Topps directly. I simply won't be able to satisfy the needs of everyone who contacts me, but I will try. You can get in touch with me by emailing me at “AllAboutCardsBlog” through Yahoo. I will leave an update here if and when I’ve run out of the ability to process anymore of these requests. Can you tell me if the recalled 2015 Topps Tribute cards not returned to Topps will increase in value? That's a great question and one that can only be guessed at. Currently prices on these cards seems to have increased because a of perceived rarity but that cause many people to open their boxes instead of returning them so there are more out there than one might imagine. Only time will tell how prices will reflect this.